This article is about bilateral relations with other countries. For other uses, see Foreign relations of the United States (disambiguation). The United States has formal diplomatic relations with most nations. This includes all U.N. member states except for Bhutan, Iran, North Korea, and Syria. Additionally, the U.S. has diplomatic relations with the European Union, the Holy See and Kosovo. The United States federal statutes relating to foreign relations can be found in Title 22 of the United States Code. Argentina was integrated into the British international economy in the late 19th century; there was minimal trade with the United States. When the United States began promoting the Pan American Union, some Argentines were suspicious that it was indeed a device to lure the country into the US economic orbit, but most businessmen responded favorably and bilateral trade grew briskly. The United States has a positive bilateral relationship with Argentina based on many common strategic interests, including non-proliferation, counternarcotics, counter-terrorism, the fight against human trafficking, and issues of regional stability, as well as the strength of commercial ties. Argentina is a participant in the Three-Plus-One regional mechanism (Argentina, Brazil, Paraguay, and the U.S.), which focuses on coordination of counter-terrorism policies in the tri-border region. Argentina has endorsed the Proliferation Security Initiative, and has implemented the Container Security Initiative and the Trade Transparency Unit, both of which are programs administered by the U.S. Department of Homeland Security/Immigration and Customs Enforcement. Although President Evo Morales has been publicly critical of U.S. policies, the United States and Bolivia had a tradition of cordial and cooperative relations. Development assistance from the United States to Bolivia dates from the 1940s, and the U.S. remains a major partner for economic development, improved health, democracy, and the environment. In 1991, the U.S. Government forgave all of the $341 million debt owed by Bolivia to the U.S. Agency for International Development (USAID) as well as 80% ($31 million) of the amount owed to the U.S. Department of Agriculture for food assistance. The United States has also been a strong supporter of forgiveness of Bolivia's multilateral debt under the HIPC initiatives. The United States was the first country to recognize the independence of Brazil, doing so in 1808. Brazil-United States relations have a long history, characterized by some moments of remarkable convergence of interests but also by sporadic and critical divergences on sensitive international issues. The United States has increasingly regarded Brazil as a significant power, especially in its role as a stabilizing force and skillful interlocutor in Latin America. As a significant political and economic power, Brazil has traditionally preferred to cooperate with the United States on specific issues rather than seeking to develop an all-encompassing, privileged relationship with the United States. Relations between Canada and the United States span more than two centuries, marked by a shared British colonial heritage, conflict during the early years of the U.S., and the eventual development of one of the most successful international relationships in the modern world. The most serious breach in the relationship was the War of 1812, which saw an American invasion of then British North America and counter invasions from British-Canadian forces. The border was demilitarized after the war and, apart from minor raids, has remained peaceful. Military collaboration began during the World Wars and continued throughout the Cold War, despite Canadian doubts about certain American policies. A high volume of trade and migration between the U.S. and Canada has generated closer ties. The current bilateral relationship between Canada and the United States is of notable importance to both countries. About 75–85% of Canadian trade is with the United States, and Canada is the United States' largest trading partner and chief supplier of oil. While there are disputed issues between the two nations, relations are close and the two countries share the "world's longest undefended border." The border was demilitarized after the War of 1812 and, apart from minor raids[clarification needed], has remained peaceful. A high volume of trade and migration between the United States and Canada since the 1850s has generated closer ties, despite continued Canadian fears of being culturally overwhelmed by its neighbor, which is nine times larger in terms of population and eleven times larger in terms of economy. The two economies have increasingly merged since the North American Free Trade Agreement (NAFTA) of 1994, which also includes Mexico. This economic merger of these two countries will be shifted when the Trump era United States–Mexico–Canada Agreement USMCA is ratified. Relations between Chile and the United States have been better in the period 1988 to 2008 than any other time in history. In the late 1980s and early 1990s, the United States government applauded the rebirth of democratic practices in Chile, despite having facilitated the 1973 Chilean coup d'état, the build-up to which included destabilizing the country's economy and politics. Regarded as one of the least corrupt and most vibrant democracies in South America, with a healthy economy, Chile is noted as being a valuable ally of the United States in the Southern Hemisphere. A prime example of cooperation includes the landmark 2003 Chile–United States Free Trade Agreement. Relations between Colombia and the United States have evolved from mutual cordiality during most of the 19th and early 20th centuries to a recent partnership that links the governments of both nations around several key issues, including fighting communism, the War on Drugs, and especially since 9/11, the threat of terrorism. During the last fifty years, different American governments and their representatives have become involved in Colombian affairs through the implementation of policies concerned with the above issues. Some critics of current U.S. policies in Colombia, such as Law Professor John Barry, consider that U.S. influences have catalyzed internal conflicts and substantially expanded the scope and nature of human rights abuses in Colombia. Supporters, such as Under Secretary of State Marc Grossman, consider that the U.S. has promoted respect for human rights and the rule of law in Colombia, in addition to the fight against drugs and terrorism. The United States of America shares a unique and often complex relationship with the United Mexican States. A history of armed conflict goes back to the Texas Revolution in the 1830s, the Mexican–American War in the 1840s, and an American invasion in the 1910s. Important treaties include the Gadsden Purchase, and multilaterally with Canada, the North American Free Trade Agreement which was changed in the Trump era to the United States–Mexico–Canada Agreement. The two countries have close economic ties, being each other's first and third largest trading partners. They are also closely connected demographically, with over one million U.S. citizens living in Mexico and Mexico being the largest source of immigrants to the United States. Illegal immigration and illegal trade in drugs and firearms have been causes of differences but also of cooperation. Nicaragua and the United States have had diplomatic relations since 1824. Between 1912-1933, the United States occupied Nicaragua (see United States occupation of Nicaragua). Following the United States occupation of Nicaragua, in 1933 the Somoza family political dynasty came to power, and would rule Nicaragua until their ouster on July 19, 1979 during the Nicaraguan Revolution. The era of Somoza family rule was characterized by rising inequality and political corruption, strong US support for the government and its military, as well as a reliance on US-based multinational corporations. This led to international condemnation of the regime and in 1977 the Carter Administration in the U.S. cut off aid to the Somoza regime due to its human rights violations. Then during the Reagan Administration the diplomatic relations escalated during the Iran-Contra affair and the United States embargo against Nicaragua. Then in 1990 after Violeta Chamorro won the Nicaraguan general election, 1990 the diplomatic relations began to improve greatly. The United States has promoted national reconciliation, encouraging Nicaraguans to resolve their problems through dialogue and compromise. In the Summer 2003 Nicaragua sent around 370 soldiers to the Iraq War as part of the U.S. coalition of countries that were engaging in war in this country. Immediately after April 2004 these troops were withdrawn by President Enrique Bolanos. Although President Daniel Ortega has been publicly critical of U.S. policies, the United States and Nicaragua have normal diplomatic relations. Panama gained its independence in 1901 due in part to American interest in building the Panama Canal. Relations have been generally strong, with 25,000 U.S. citizens present in Panama and a mutual healthcare program. The U.S. invaded Panama in 1989 to remove then Panamanian leader Manual Noriega. In 2002, Uruguay and the U.S. created a Joint Commission on Trade and Investment (JCTI) to exchange ideas on a variety of economic topics. In March 2003, the JCTI identified six areas of concentration until the eventual signing of the Free Trade Area of the Americas (FTAA): customs issues, intellectual property protection, investment, labor, environment, and trade in goods. In late 2004, Uruguay and the U.S. signed an Open Skies Agreement, which was ratified in May 2006. In November 2005, they signed a Bilateral investment treaty (BIT), which entered into force on November 1, 2006. A Trade and Investment Framework Agreement (TIFA) was signed in January 2007. More than 80 U.S.-owned companies operate in Uruguay, and many more market U.S. goods and services. Both countries maintained mutual diplomatic relationships since the early-19th century traditionally been characterized by an important trade and investment relationship and cooperation in controlling the production and transit of illegal drugs. After the election of Presidents Hugo Chávez of Venezuela and George W. Bush of the United States and particularly after the Venezuelan failed coup attempt in 2002 against Chavez, tensions between the countries escalated, reaching a high in September 2008 when Venezuela broke off diplomatic relations with the U.S. Relations showed signs of improvement in 2009 with the election of the new U.S. President Barack Obama, including the re-establishment of diplomatic relations in June 2009. In January 2019, after U.S. President Donald Trump recognized Juan Guaidó as the Interim President of Venezuela, President Nicolás Maduro cut all diplomatic ties to the United States (2019 Venezuelan presidential crisis) and ordered all U.S. diplomats to leave the country. On the 26th of January the Maduro government suspended its deadline to U.S. diplomats to leave the country. Following the Cuban Revolution of 1959 relations had deteriorated substantially, and until recently have been marked by tension and confrontation. The United States has initiated an embargo due to the Cuban regime refusal to move toward democratization and greater respect for human rights, hoping to see democratization that took place in Eastern Europe. Diplomatic relations between the United States and Cuba were formally re-established on July 20, 2015 with the opening of embassies in both Havana and Washington, D.C.
American relations with Eastern Europe are influenced by the legacy of the Cold War. Since the collapse of the Soviet Union, former Communist-bloc states in Europe have gradually transitioned to democracy and capitalism. Many have also joined the European Union and NATO, strengthening economic ties with the broader Western world and gaining the military protection of the United States via the North Atlantic Treaty. The United States was one of the first countries to recognize Kosovo. The UN Security Council divided on the question of Kosovo's declaration of independence. Kosovo declared its independence on February 17, 2008, whilst Serbia objected that Kosovo is part of its territory. Of the five members with veto power in the UN Security Council, the US, UK, and France recognized the declaration of independence, and China has expressed concern, while Russia considers it illegal. "In its declaration of independence, Kosovo committed itself to the highest standards of democracy, including freedom and tolerance and justice for citizens of all ethnic backgrounds", President George W. Bush said on February 19, 2008. 13 U.S. States declared independence from the United Kingdom in 1776. Since World War II, the two countries have shared a Special Relationship as part of the Anglosphere. While both the United States and the United Kingdom maintain close relationships with many other nations around the world, the level of cooperation in military planning, execution of military operations, nuclear weapons technology, and intelligence sharing with each other has been described as "unparalleled" among major powers throughout the 20th and early 21st century. The United States and Britain share the world's largest foreign direct investment partnership. American investment in the United Kingdom reached $255.4 billion in 2002, while British direct investment in the United States totaled $283.3 billion. The official U.S. presence in Algeria is expanding following over a decade of limited staffing, reflecting the general improvement in the security environment. During the past three years, the U.S. Embassy has moved toward more normal operations and now provides most embassy services to the American and Algerian communities. The Arab League has an embassy, and several offices in the U.S.
After the 1973 Arab-Israeli War, Egyptian foreign policy began to shift as a result of the change in Egypt's leadership from President Gamal Abdel-Nasser to Anwar Sadat and the emerging peace process between Egypt and Israel. Sadat realized that reaching a settlement of the Arab-Israeli conflict is a precondition for Egyptian development. To achieve this goal, Sadat ventured to enhance U.S.-Egyptian relations to foster a peace process with Israel. In 2011, the United States cut diplomatic relations with the Gaddafi regime. The United States recognized the National Transitional Council as the legitimate government of Libya on July 15, 2011. Morocco was the first sovereign nation to recognize the United States of America in 1776. American-Moroccan relations were formalized in a 1787 treaty, which is still in force and is the oldest unbroken bilateral treaty in American history. Relations were tense during the Angolan Civil War when the U.S. government backed UNITA rebels, but have warmed since the Angolan government renounced Marxism in 1992. The two nations have had an excellent history of relations in the years since Benin embraced democracy. The U.S. Government continues to assist Benin with the improvement of living standards that are key to the ultimate success of Benin's experiment with democratic government and economic liberalization, and are consistent with U.S. values and national interest in reducing poverty and promoting growth. The bulk of the U.S. effort in support of consolidating democracy in Benin is focused on long-term human resource development through U.S. Agency for International Development (USAID) programs. Bilateral relations between the United States and Uganda have been good since Yoweri Museveni assumed power, and the United States has welcomed his efforts to end human rights abuses and to pursue economic reform. Uganda is a strong supporter of the Global War on Terror. The United States is helping Uganda achieve export-led economic growth through the African Growth and Opportunity Act and provides a significant amount of development assistance. At the same time, the United States is concerned about continuing human rights problems and the pace of progress toward the establishment of genuine political pluralism. The diplomatic relationship between the United States and Zambia can be characterized as warm and cooperative. The United States works closely with the Zambian Government to defeat the HIV/AIDS pandemic that is ravaging Zambia, to promote economic growth and development, and to effect political reform needed to promote responsive and responsible government. The United States is also supporting the government's efforts to root out corruption. Zambia is a beneficiary of the African Growth and Opportunity Act (AGOA). The U.S. Government provides a variety of technical assistance and other support that is managed by the U.S. Department of State, U.S. Agency for International Development, Millennium Challenge Corporation (MCC) Threshold Program, Centers for Disease Control and Prevention, U.S. Department of Treasury, U.S. Department of Defense, and Peace Corps. The majority of U.S. assistance is provided through the President's Emergency Plan for AIDS Relief (PEPFAR), in support of the fight against HIV/AIDS. After Morgan Tsvangirai, Mugabe's rival and leader of the Movement for Democratic Change, became Prime Minister of Zimbabwe under a power-sharing agreement, the Barack Obama administration extended its congratulations to Tsvangirai, but said that the U.S. would wait for evidence of Mugabe's cooperation with the MDC before it would consider lifting its sanctions. In early March 2009, Obama proclaimed that U.S. sanctions would be protracted provisionally for another year, because Zimbabwe's political crisis is as yet unresolved. The United States has many important allies in the Greater Middle East region. These allies are Turkey, Saudi Arabia, Morocco, Jordan, Afghanistan, Israel, Egypt, Kuwait, Bahrain and Qatar. Israel and Egypt are leading recipients of United States foreign aid, receiving $2.775 billion and 1.75 billion in 2010. Turkey is an ally of the United States through its membership in NATO, while all of the other countries except Saudi Arabia and Qatar are major non-NATO allies. The United States toppled the government of Saddam Hussein during the 2003 invasion of Iraq. Turkey is host to approximately 90 B61 nuclear bombs at Incirlik Air Base. Other allies include Qatar, where 3,500 U.S. troops are based, and Bahrain, where the United States Navy maintains NSA Bahrain, home of NAVCENT and the Fifth Fleet. The United States and the Kingdom of Persia recognized each other in 1850. Diplomatic relations were established in 1883 and severed in 1980. The United States was the third country to establish formal diplomatic relations with the UAE and has had an ambassador resident in the UAE since 1974. The two countries have enjoyed friendly relations with each other and have developed into friendly government-to-government ties which include security assistance. UAE and U.S. had enjoyed private commercial ties, especially in petroleum. The quality of U.S.-UAE relations increased dramatically as a result of the U.S.-led coalition's campaign to end the Iraqi occupation of Kuwait. UAE ports host more U.S. Navy ships than any port outside the U.S. Traditionally, United States – Yemen relations have been tepid, as the lack of strong military-to-military ties, commercial relations, and support of Yemeni President Ali Abdullah Saleh has hindered the development of strong bilateral ties. During the early years of the George W. Bush administration, relations improved under the rubric of the War on Terror, though Yemen's lack of policies toward wanted terrorists has stalled additional U.S. support. The U.S. Embassy, USAID, and the Peace Corps are located in Ashgabat, Turkmenistan. The United States and Turkmenistan continue to disagree about the country's path toward democratic and economic reform. The United States has publicly advocated industrial privatization, market liberalization, and fiscal reform, as well as legal and regulatory reforms to open up the economy to foreign trade and investment, as the best way to achieve prosperity and true independence and sovereignty. Relations improved slightly in the latter half of 2007, but the U.S. continues to call for Uzbekistan to meet all of its commitments under the March 2002 Declaration of Strategic Partnership between the two countries. The declaration covers not only security and economic relations but political reform, economic reform, and human rights. Uzbekistan has Central Asia's largest population and is vital to U.S., regional, and international efforts to promote stability and security. Today the relationship between the two countries is based on what is described by American diplomats as the "three Ds", meaning Democracy, Development and Denial of space for terrorism. The United States is closely working with Bangladesh in combating Islamic extremism and terrorism and is providing hundreds of millions of dollars every year in economic assistance. While the U.S. has no formal diplomatic relations with Bhutan, it maintains informal contact through its embassy in New Delhi, India. The U.S. has offered to resettle 60,000 of the 107,000 Bhutanese refugees of Nepalese origin now living in seven U.N. refugee camps in southeastern Nepal. The relationships between India in the days of the British Raj and the US were thin. Swami Vivekananda promoted Yoga and Vedanta in America at the World's Parliament of Religions in Chicago, during the World's Fair in 1893. Mark Twain visited India in 1896 and described it in his travelogue Following the Equator with both revulsion and attraction before concluding that India was the only foreign land he dreamed about or longed to see again. Regarding India, Americans learned more from English writer Rudyard Kipling. Mahatma Gandhi had an important influence on the philosophy of non-violence promoted by Martin Luther King, Jr. in the 1950s. At present, India and the US share an extensive and expanding cultural, strategic, military, and economic relationship which is in the phase of implementing confidence building measures (CBM) to overcome the legacy of trust deficit – brought about by adversarial US foreign policies  and multiple instances of technology denial  – which have plagued the relationship over several decades. Unrealistic expectations after the conclusion of the 2008 U.S.–India Civil Nuclear Agreement (which underestimated negative public opinion regarding the long-term viability of nuclear power generation and civil-society endorsement for contractual guarantees on safeguards and liability) has given way to pragmatic realism and refocus on areas of cooperation which enjoy favourable political and electoral consensus. American relations with the People's Republic of China are quite strong, yet complex. A great amount of trade between the two countries necessitates positive political relations, although occasional disagreements over tariffs, currency exchange rates and the Political status of Taiwan do occur. Nevertheless, the United States and China have an extremely extensive partnership. The U.S. criticizes China on human rights issues and in recent years,for example, the mass detaining of Uyghurs and Kazakhs in Xinjiang or the cultural assimilation of Mongols and Tibetan. China has criticized the United States on human rights in return also. The United States acknowledges the People's Republic's One-China policy. The U.S. recognized the Nationalist Government as the legitimate government of all of China throughout the Chinese Civil War. The U.S. continued to recognize the Republic of China until 1979, when it shifted its recognition to the People's Republic of China in accordance with the One China policy. The U.S. continued to provide Taiwan with military aid after 1979, and continued informal relations through the American Institute in Taiwan, and is considered to be a strong Asian ally and supporter of the United States. The relationship began in the 1850s as the U.S. was a major factor in forcing Japan to resume contacts with the outer world beyond a very restricted role. In the late 19th century the Japanese sent many delegations to Europe, and some to the U.S., to discover and copy the latest technology and thereby modernize Japan very rapidly and allow it to build its own empire. There was some friction over control of Hawaii and the Philippines, but Japan stood aside as the U.S. annexed those lands in 1898. Likewise the U.S. did not object when Japan took control of Korea. The two nations cooperated with the European powers in suppressing the Boxer Rebellion in China in 1900, but the U.S. was increasingly troubled about Japan's denial of the Open Door Policy that would ensure that all nations could do business with China on an equal basis. President Theodore Roosevelt admired Japan's strength as it defeated a major European power, Russia. He brokered an end to the war between Russia and Japan in 1905–6. Anti-Japanese sentiment (especially on the West Coast) soured relations in the 1907–24 era. In the 1930s the U.S. protested vehemently against Japan's seizure of Manchuria (1931), its war against China (1937–45), and its seizure of Indochina (Vietnam) 1940–41. American sympathies were with China and Japan rejected increasingly angry American demands that Japan pull out of China. The two nations fought an all-out war 1941–45; the U.S. won a total victory, with heavy bombing (including two atomic bombs on Hiroshima and Nagasaki) that devastated Japan's 50 largest industrial cities. The American army under Douglas MacArthur occupied and ruled Japan, 1945–51, with the successful goal of sponsoring a peaceful, prosperous and democratic nation. In 1951, the U.S. and Japan signed Treaty of San Francisco and Security Treaty Between the United States and Japan, subsequently revised as Treaty of Mutual Cooperation and Security between the United States and Japan in 1960, relations since then have been excellent. The United States considers Japan to be one of its closest allies, and it is both a Major Non-NATO ally and NATO contact country. The United States has several military bases in Japan including Yokosuka, which harbors the U.S. 7th Fleet. The JSDF, or Japanese Self Defense Force, cross train with the U.S. Military, often providing auxiliary security and conducting war games. South Korea–United States relations have been most extensive since 1945, when the United States helped establish capitalism in South Korea and led the UN-sponsored Korean War against North Korea and China (1950–53). South Korea's rapid economic growth, democratization and modernization greatly reduced its U.S. dependency. Large numbers of U.S. forces remain in Korea. On September 24, 2018 President Donald Trump signed the United States-South Korea Trade Deal with South Korean President Moon Jae-in. Many countries in the Association of Southeast Asian Nations (ASEAN) are important partners for United States in both economic and geostrategic aspects. ASEAN's geostrategic importance stems from many factors, including: the strategic location of member countries, the large shares of global trade that pass through regional waters, and the alliances and partnerships which the United States shares with ASEAN member states. In July 2009, the United States signed ASEAN's Treaty of Amity and Cooperation, which establishes guiding principles intended to build confidence among its signatories with the aim of maintaining regional peace and stability. Trade flows are robust and increasing between America and the ASEAN region. The U.S. welcomed Brunei Darussalam's full independence from the United Kingdom on January 1, 1984, and opened an embassy in Bandar Seri Begawan on that date. Brunei opened its embassy in Washington, D.C. in March 1984. Brunei's armed forces engage in joint exercises, training programs, and other military cooperation with the U.S. A memorandum of understanding on defense cooperation was signed on November 29, 1994. The Sultan of Brunei visited Washington in December 2002. As the largest ASEAN member, Indonesia has played an active and prominent role in developing the organization. For United States, Indonesia is important for dealing with certain issues; such as terrorism, democracy, and how United States project its relations with Islamic world, since Indonesia has the world's largest Islamic population, and one that honors and respects religious diversity. The U.S. eyes Indonesia as a potential strategic ally in Southeast Asia. During his stately visit to Indonesia, U.S. President Barack Obama has held up Indonesia as an example of how a developing nation can embrace democracy and diversity. Despite increasingly strained relations under the Mahathir Mohamad government, ties have been thawed under Najib Razak's administration. Economic ties are particularly robust, with the United States being Malaysia's largest trading partner and Malaysia is the tenth-largest trading partner of the U.S. Annual two-way trade amounts to $50 billion. The United States and Malaysia launched negotiations for a bilateral free trade agreement (FTA) in June 2006. The United States and Malaysia enjoy strong security cooperation. Malaysia hosts the Southeast Asia Regional Center for Counterterrorism (SEARCCT), where over 2000 officials from various countries have received training. The United States is among the foreign countries that has collaborated with the center in conducting capacity building programmes. The U.S. and Malaysia share a strong military-to-military relationship with numerous exchanges, training, joint exercises, and visits. Bilateral ties have generally been strained but are slowly improving. The United States has placed broad sanctions on Burma because of the military crackdown in 1988 and the military regime's refusal to honour the election results of the 1990 People's Assembly election. Similarly, the European Union has placed embargoes on Burma, including an arms embargo, cessation of trade preferences, and suspension of all aid with the exception of humanitarian aid. US and European government sanctions against the military government, alongside boycotts and other types direct pressure on corporations by western supporters of the Burmese democracy movement, have resulted in the withdrawal from Burma of most U.S. and many European companies. However, several Western companies remain due to loopholes in the sanctions. Asian corporations have generally remained willing to continue investing in Myanmar and to initiate new investments, particularly in natural resource extraction. Ongoing reforms have improved relations between Burma and the United States. However the Rohingya Crisis has been deteriorating ties. The Philippines and the United States have an extremely strong relationship with each other due to their long standing alliance. The Spanish government ceded the Philippines to the United States in the 1898 Treaty of Paris that ended the Spanish–American War. The Philippines was a U.S. colony from 1898-1946. The United States finally recognized Philippine independence on July 4, 1946 in the Treaty of Manila. July 4 was observed in the Philippines as Independence Day until August 4, 1964 when, upon the advice of historians and the urging of nationalists, President Diosdado Macapagal signed into law Republic Act No. 4166 designating June 12 as the country's Independence Day. The U.S. and the Philippines have fought together in many conflicts such as World War I, World War II, the Korean War, Vietnam War, Islamic insurgency in the Philippines, Gulf War and the War on Terror. The Philippines and the United States still maintain close, friendly, diplomatic, political and military relations with 100,000+ U.S. citizens and nationals living in the Philippines and more than 4 million Filipinos living in the United States. Both countries actively cooperate in the trade, investment and financial sectors. The U.S. is also the largest investor in the Philippine economy with an estimated total worth of $63 billion. The United States and the Philippines conduct joint military exercises called the Balikatan that take place once a year to boost relations between the two countries. The U.S. military also conduct humanitarian and aid missions in the Philippines. The Philippines is one out of two major U.S. allies in South East Asia. Since 2003 the U.S. has designated the Philippines as a Major Non-NATO Ally. However, relations between the United States and the Philippines began to deteriorate in 2016, under President Rodrigo Duterte, wanting to form an alliance with China and Russia and separating the country from all connections and ties with the United States, both economically and socially. Thailand and the U.S. are both former Southeast Asia Treaty Organization (SEATO) members, being close partners throughout the Cold War, and are still close allies. Since 2003, the U.S. has designated Thailand as a Major Non-NATO Ally. After a 20-year hiatus of severed ties, President Bill Clinton announced the formal normalization of diplomatic relations with Vietnam on July 11, 1995. Subsequent to President Clinton's normalization announcement, in August 1995, both nations upgraded their Liaison Offices opened during January 1995 to embassy status. As diplomatic ties between the nations grew, the United States opened a consulate general in Ho Chi Minh City, and Vietnam opened a consulate in San Francisco. Today, the U.S. eyes Vietnam as a potential strategic ally in Southeast Asia. Australia and the United States have long been close and strategic allies and have traditionally been aligned with the Commonwealth of Nations. The two countries have a shared history, both have previously been British Colonies and many Americans flocked to the Australian goldfields in the 19th century. At the strategic level, the relationship really came to prominence in the Second World War, when the two nations worked extremely closely in the Pacific War against Japan, with General Douglas MacArthur undertaking his role as Supreme Allied Commander based in Australia, effectively having Australian troops and resources under his command. During this period, the cultural interaction between Australia and the U.S. were elevated to a higher level as over 1 million U.S. military personnel moved through Australia during the course of the war. The relationship continued to evolve throughout the second half of the 20th Century, and today now involves strong relationships at the executive and mid levels of government and the military, leading Assistant Secretary of State for East Asian and Pacific Affairs, Kurt M. Campbell to declare that "in the last ten years, [Australia] has ascended to one of the closest one or two allies [of the U.S.] on the planet". It was also strengthened its relationship with the United States as Britain's influence in Asia declined. At the governmental level, United States-Australia relations are formalized by the ANZUS treaty and the Australia–United States Free Trade Agreement. Relations are currently poor, due to the United States' opposition to Fiji's unelected government, which came to power through a military coup in December 2006. The United States suspended $2.5 million in aid money pending a review of the situation, following the 2006 coup. Relations between Kiribati and the United States are excellent. Kiribati signed a treaty of friendship with the United States after independence in 1979. The United States has no consular or diplomatic facilities in the country. Officers of the American Embassy in Suva, Fiji, are concurrently accredited to Kiribati and make periodic visits. The U.S. Peace Corps maintained a program in Kiribati from 1974 to 2008. Reflecting a strong legacy of Trusteeship cooperation, over 25 U.S. federal agencies continue to maintain programs in the FSM. The United States and the FSM share very strong relations. Under the Amended Compact, the U.S. has full authority and responsibility for the defense of the FSM. This security relationship can be changed or terminated by mutual agreement. The Compact that binds the U.S. and the FSM is the same one that binds the United States to the Marshall Islands and to Palau. United States-New Zealand relations are strong, but complex. The United States was historically assisted New Zealand in times of turmoil; for instance, during the World War II, U.S. bombing Hiroshima and Nagasaki, and with the September 2010 Canterbury earthquake. New Zealand has reciprocated; for example, by participating in between Korean and Vietnam War. However, the United States suspended its mutual defense obligations to New Zealand because of that state's non-nuclear policies. Despite disagreements between the two countries, the bilateral trade and cultural relationship continued to flourish. New Zealand was continued to play a supportive role in international conflicts in Somalia, Bosnia, and the Persian Gulf. Following the 9/11 attacks on the United States since 2001, New Zealand supported international counter-terrorism efforts and assisted the United States throughout the war in Afghanistan. Throughout the 2000s, the United States was remained New Zealand’s fourth-largest trading partner and third-largest source of visitors. On October 1, 1994, after five decades of U.S. administration, the country of Palau became the last component of the Trust Territory of the Pacific Islands to gain its independence. In 1978, Palau decided not to join the Federated States of Micronesia, due to culture and language differences, and instead sought independence. In 1986, the Compact of Free Association agreement between Palau and the United States was approved, paving the way for Palau's independence. After independence in 1978, the United States kept its close relations with the Solomon Islands. Both cooperate within regional organizations in the Pacific, and the United States has an embassy at Port Moresby. Relations between the two countries are generally amicable, or neutral, but there have been notable disagreements regarding the issues of climate change and the Kyoto Protocol. The United States and Vanuatu established diplomatic relations on September 30, 1986 - three months to the day after Vanuatu had established diplomatic relations with the Soviet Union. Relations were often tense in the 1980s, under the prime ministership of Father Walter Lini in Vanuatu, but eased after that. At present, bilateral relations consist primarily in U.S. aid to Vanuatu. ^ "Argentina - Countries - Office of the Historian". Retrieved February 19, 2015. ^ "Belize - Countries - Office of the Historian". Retrieved February 19, 2015. ^ "Bolivia - Countries - Office of the Historian". Retrieved February 19, 2015. ^ "Brazil - Countries - Office of the Historian". Retrieved February 19, 2015. ^ "Canada - Countries - Office of the Historian". Retrieved February 19, 2015. ^ "Canada". International Monetary Fund. Retrieved November 5, 2011. ^ "Chile - Countries - Office of the Historian". Retrieved February 19, 2015. ^ "Colombia - Countries - Office of the Historian". Retrieved February 19, 2015. ^ "Costa Rica - Countries - Office of the Historian". Retrieved February 19, 2015. ^ "Ecuador - Countries - Office of the Historian". Retrieved February 19, 2015. ^ "El Salvador - Countries - Office of the Historian". Retrieved February 19, 2015. ^ "Guatemala - Countries - Office of the Historian". Retrieved February 19, 2015. ^ "Guyana - Countries - Office of the Historian". Retrieved February 19, 2015. ^ "Honduras - Countries - Office of the Historian". Retrieved February 19, 2015. ^ "Mexico - Countries - Office of the Historian". Retrieved February 19, 2015. ^ "Nicaragua - Countries - Office of the Historian". Retrieved February 19, 2015. ^ "Panama - Countries - Office of the Historian". Retrieved February 19, 2015. ^ "Paraguay - Countries - Office of the Historian". Retrieved February 19, 2015. ^ "Peru - Countries - Office of the Historian". Retrieved February 19, 2015. ^ "Suriname - Countries - Office of the Historian". Retrieved February 19, 2015. ^ "Uruguay - Countries - Office of the Historian". Retrieved February 19, 2015. ^ "Venezuela - Countries - Office of the Historian". Retrieved February 19, 2015. ^ "U.S. Diplomats Are Starting to Leave Venezuela Amid Maduro's Tense Standoff With Washington". Time. Retrieved January 28, 2019. ^ Press, Associated. "Venezuela suspends deadline for U.S. diplomats". POLITICO. Retrieved January 28, 2019. ^ "Antigua and Barbuda - Countries - Office of the Historian". Retrieved February 19, 2015. ^ "The Bahamas - Countries - Office of the Historian". Retrieved February 19, 2015. ^ "Barbados - Countries - Office of the Historian". Retrieved February 19, 2015. ^ "Cuba - Countries - Office of the Historian". Retrieved February 19, 2015. ^ "Cuban Democracy Act of 1992". State Department. Archived from the original on August 17, 2000. ^ Scott, Eugene. "Obama announces re-establishment of U.S.-Cuba diplomatic ties". CNN. Retrieved July 7, 2015. ^ "Dominican Republic - Countries - Office of the Historian". Retrieved February 19, 2015. ^ "Dominica - Countries - Office of the Historian". Retrieved February 19, 2015. ^ "Grenada - Countries - Office of the Historian". Retrieved February 19, 2015. ^ "Haiti - Countries - Office of the Historian". Retrieved February 19, 2015. ^ "Jamaica - Countries - Office of the Historian". Retrieved February 19, 2015. ^ "Saint Kitts and Nevis - Countries - Office of the Historian". Retrieved February 19, 2015. ^ "Saint Lucia - Countries - Office of the Historian". Retrieved February 19, 2015. ^ "Saint Vincent and the Grenadines - Countries - Office of the Historian". Retrieved February 19, 2015. ^ "Trinidad and Tobago - Countries - Office of the Historian". Retrieved February 19, 2015. ^ "Albania - Countries - Office of the Historian". Retrieved February 19, 2015. ^ "Andorra - Countries - Office of the Historian". Retrieved February 19, 2015. ^ "Armenia - Countries - Office of the Historian". Retrieved February 19, 2015. ^ "Austria - Countries - Office of the Historian". Retrieved February 19, 2015. ^ "Azerbaijan - Countries - Office of the Historian". Retrieved February 19, 2015. ^ "Belarus - Countries - Office of the Historian". Retrieved February 19, 2015. ^ "Belgium - Countries - Office of the Historian". Retrieved February 19, 2015. ^ "Bosnia-Herzegovina - Countries - Office of the Historian". Retrieved February 19, 2015. ^ "Bulgaria - Countries - Office of the Historian". Retrieved February 19, 2015. ^ "Croatia - Countries - Office of the Historian". Retrieved February 19, 2015. ^ "Cyprus - Countries - Office of the Historian". Retrieved February 19, 2015. ^ "The Czech Republic - Countries - Office of the Historian". Retrieved February 19, 2015. ^ "Denmark - Countries - Office of the Historian". Retrieved February 19, 2015. ^ "Estonia - Countries - Office of the Historian". Retrieved February 19, 2015. ^ "Finland - Countries - Office of the Historian". Retrieved February 19, 2015. ^ "France - Countries - Office of the Historian". Retrieved February 19, 2015. ^ "Georgia - Countries - Office of the Historian". Retrieved February 19, 2015. ^ "Germany - Countries - Office of the Historian". Retrieved February 19, 2015. ^ "Greece - Countries - Office of the Historian". Retrieved February 19, 2015. ^ "Holy See - Countries - Office of the Historian". Retrieved February 19, 2015. ^ "Hungary - Countries - Office of the Historian". Retrieved February 19, 2015. ^ "Iceland - Countries - Office of the Historian". Retrieved February 19, 2015. ^ "Ireland - Countries - Office of the Historian". Retrieved February 19, 2015. ^ "Italy - Countries - Office of the Historian". Retrieved February 19, 2015. ^ "Kosovo - Countries - Office of the Historian". Retrieved February 19, 2015. ^ "Latvia - Countries - Office of the Historian". Retrieved February 19, 2015. ^ "Liechtenstein - Countries - Office of the Historian". Retrieved February 19, 2015. ^ "Lithuania - Countries - Office of the Historian". Retrieved February 19, 2015. ^ "Luxembourg - Countries - Office of the Historian". Retrieved February 19, 2015. ^ "Malta - Countries - Office of the Historian". Retrieved February 19, 2015. ^ "Moldova - Countries - Office of the Historian". Retrieved February 19, 2015. ^ "Monaco - Countries - Office of the Historian". Retrieved February 19, 2015. ^ "Montenegro - Countries - Office of the Historian". Retrieved February 19, 2015. ^ "The Netherlands - Countries - Office of the Historian". Retrieved February 19, 2015. ^ "Macedonia - Countries - Office of the Historian". Retrieved February 19, 2015. ^ "Norway - Countries - Office of the Historian". Retrieved February 19, 2015. ^ "Poland - Countries - Office of the Historian". Retrieved February 19, 2015. ^ "Portugal - Countries - Office of the Historian". Retrieved February 19, 2015. ^ "Romania - Countries - Office of the Historian". Retrieved February 19, 2015. ^ "Russia - Countries - Office of the Historian". Retrieved February 19, 2015. ^ "San Marino - Countries - Office of the Historian". Retrieved February 19, 2015. ^ "Serbia - Countries - Office of the Historian". Retrieved February 19, 2015. ^ "Slovakia - Countries - Office of the Historian". Retrieved February 19, 2015. ^ "Slovenia - Countries - Office of the Historian". Retrieved February 19, 2015. ^ "Spain - Countries - Office of the Historian". Retrieved February 19, 2015. ^ "Sweden - Countries - Office of the Historian". Retrieved February 19, 2015. ^ "Switzerland - Countries - Office of the Historian". Retrieved February 19, 2015. ^ "Ukraine - Countries - Office of the Historian". Retrieved February 19, 2015. ^ "The United Kingdom - Countries - Office of the Historian". Retrieved February 19, 2015. ^ James, Wither (March 2006). "An Endangered Partnership: The Anglo-American Defence Relationship in the Early Twenty-first Century". European Security. 15 (1): 47–65. doi:10.1080/09662830600776694. ISSN 0966-2839. ^ "Algeria - Countries - Office of the Historian". Retrieved February 19, 2015. ^ "Egypt - Countries - Office of the Historian". Retrieved February 19, 2015. ^ "Libya - Countries - Office of the Historian". Retrieved February 19, 2015. ^ "U.S. formally recognizes Libyan rebels as legitimate government". Kansas City star. July 15, 2011. Retrieved July 16, 2011. ^ "Morocco - Countries - Office of the Historian". Retrieved February 19, 2015. ^ "Sudan - Countries - Office of the Historian". Retrieved February 19, 2015. ^ "Tunisia - Countries - Office of the Historian". Retrieved February 19, 2015. ^ "Angola - Countries - Office of the Historian". Retrieved February 19, 2015. ^ "Benin (Dahomey) - Countries - Office of the Historian". Retrieved February 19, 2015. ^ "Botswana - Countries - Office of the Historian". Retrieved February 19, 2015. ^ "Burkina Faso (Upper Volta) - Countries - Office of the Historian". Retrieved February 19, 2015. ^ "Burundi - Countries - Office of the Historian". Retrieved February 19, 2015. ^ "Cameroon - Countries - Office of the Historian". Retrieved February 19, 2015. ^ "Cape Verde - Countries - Office of the Historian". Retrieved February 19, 2015. ^ "Central African Republic - Countries - Office of the Historian". Retrieved February 19, 2015. ^ "Chad - Countries - Office of the Historian". Retrieved February 19, 2015. ^ "Comoros - Countries - Office of the Historian". Retrieved February 19, 2015. ^ "Cote D'Ivoire (Ivory Coast) - Countries - Office of the Historian". Retrieved February 19, 2015. ^ "Democratic Republic of the Congo - Countries - Office of the Historian". Retrieved February 19, 2015. ^ "Djibouti - Countries - Office of the Historian". Retrieved February 19, 2015. ^ "Equatorial Guinea - Countries - Office of the Historian". Retrieved February 19, 2015. ^ "Eritrea - Countries - Office of the Historian". Retrieved February 19, 2015. ^ "Ethiopia - Countries - Office of the Historian". Retrieved February 19, 2015. ^ "Gabon - Countries - Office of the Historian". Retrieved February 19, 2015. ^ "Ghana - Countries - Office of the Historian". Retrieved February 19, 2015. ^ "Guinea - Countries - Office of the Historian". Retrieved February 19, 2015. ^ "Guinea-Bissau - Countries - Office of the Historian". Retrieved February 19, 2015. ^ "Kenya - Countries - Office of the Historian". Retrieved February 19, 2015. ^ "Lesotho - Countries - Office of the Historian". Retrieved February 19, 2015. ^ "Liberia - Countries - Office of the Historian". Retrieved February 19, 2015. ^ "Madagascar - Countries - Office of the Historian". Retrieved February 19, 2015. ^ "Malawi - Countries - Office of the Historian". Retrieved February 19, 2015. ^ "Mali - Countries - Office of the Historian". Retrieved February 19, 2015. ^ "Mauritania - Countries - Office of the Historian". Retrieved February 19, 2015. ^ "Mauritius - Countries - Office of the Historian". Retrieved February 19, 2015. ^ "Mozambique - Countries - Office of the Historian". Retrieved February 19, 2015. ^ "Namibia - Countries - Office of the Historian". Retrieved February 19, 2015. ^ "Niger - Countries - Office of the Historian". Retrieved February 19, 2015. ^ "Nigeria - Countries - Office of the Historian". Retrieved February 19, 2015. ^ "Republic of the Congo - Countries - Office of the Historian". Retrieved February 19, 2015. ^ "Rwanda - Countries - Office of the Historian". Retrieved February 19, 2015. ^ "Sao Tome and Principe - Countries - Office of the Historian". Retrieved February 19, 2015. ^ "Senegal - Countries - Office of the Historian". Retrieved February 19, 2015. ^ "Seychelles - Countries - Office of the Historian". Retrieved February 19, 2015. ^ "Sierra Leone - Countries - Office of the Historian". Retrieved February 19, 2015. ^ "Somalia - Countries - Office of the Historian". Retrieved February 19, 2015. ^ "South Africa - Countries - Office of the Historian". Retrieved February 19, 2015. ^ "South Sudan - Countries - Office of the Historian". Retrieved February 19, 2015. ^ "Swaziland - Countries - Office of the Historian". Retrieved February 19, 2015. ^ "Tanzania - Countries - Office of the Historian". Retrieved February 19, 2015. ^ "The Gambia - Countries - Office of the Historian". Retrieved February 19, 2015. ^ "Togo - Countries - Office of the Historian". Retrieved February 19, 2015. ^ "Uganda - Countries - Office of the Historian". Retrieved February 19, 2015. ^ "Zambia - Countries - Office of the Historian". Retrieved February 19, 2015. ^ "Zimbabwe - Countries - Office of the Historian". Retrieved February 19, 2015. ^ "Obama congratulates Tsvangirai". NewsToday.co.za. February 13, 2009. Archived from the original on August 6, 2009. ^ "Page Not Found". www.jewishvirtuallibrary.org. Retrieved October 14, 2017. ^ Anne Davies (January 2, 2010). "US aid tied to purchase of arms". The Sydney Morning Herald. Retrieved October 14, 2017. ^ Amy Belasco. "The Cost of Iraq, Afghanistan, and Other Global War on Terror Operations Since 9/11" (PDF). Fas.org. Retrieved October 14, 2017. ^ "Report: US considers withdrawing nuclear bombs from Turkey". Todayszaman.com. April 3, 2010. Archived from the original on October 15, 2014. Retrieved August 18, 2014. ^ Sciutto, Jim. "U.S. Troops Preparing for War in Qatar - ABC News". Abcnews.go.com. Retrieved August 18, 2014. ^ "Bahrain - Countries - Office of the Historian". Retrieved February 19, 2015. ^ "Iran - Countries - Office of the Historian". Retrieved February 19, 2015. ^ "Iraq - Countries - Office of the Historian". Retrieved February 19, 2015. ^ "Israel - Countries - Office of the Historian". Retrieved February 19, 2015. ^ "Jordan - Countries - Office of the Historian". Retrieved February 19, 2015. ^ "Kuwait - Countries - Office of the Historian". Retrieved February 19, 2015. ^ "Lebanon - Countries - Office of the Historian". Retrieved February 19, 2015. ^ "Oman - Countries - Office of the Historian". Retrieved February 19, 2015. ^ "Qatar - Countries - Office of the Historian". Retrieved February 19, 2015. ^ "Saudi Arabia - Countries - Office of the Historian". Retrieved February 19, 2015. ^ "Syria - Countries - Office of the Historian". Retrieved February 19, 2015. ^ "Turkey - Countries - Office of the Historian". Retrieved February 19, 2015. ^ "The United Arab Emirates - Countries - Office of the Historian". Retrieved February 19, 2015. ^ "Yemen - Countries - Office of the Historian". Retrieved February 19, 2015. ^ "Kazakhstan - Countries - Office of the Historian". Retrieved February 19, 2015. ^ "Kyrgyzstan - Countries - Office of the Historian". Retrieved February 19, 2015. ^ "Tajikistan - Countries - Office of the Historian". Retrieved February 19, 2015. ^ "Turkmenistan - Countries - Office of the Historian". Retrieved February 19, 2015. ^ "Uzbekistan - Countries - Office of the Historian". Retrieved February 19, 2015. ^ "Afghanistan - Countries - Office of the Historian". Retrieved February 19, 2015. ^ "Bangladesh - Countries - Office of the Historian". Retrieved February 19, 2015. ^ "Bhutan". U.S. Department of State. Retrieved February 19, 2015. ^ "India - Countries - Office of the Historian". Retrieved February 19, 2015. ^ Holden Furber, "Historical and Cultural Aspects of Indo-American Relations," Journal of the University of Bombay (1965), Vol. 34 Issue 67/68, pp 95-116. ^ Barbara Schmidt. "Chronology of Known Mark Twain Speeches, Public Readings, and Lectures". marktwainquotes.com. Retrieved January 1, 2013. ^ "India-U.S. Economic and Trade Relations" (PDF). Federation of American Scientists. Retrieved March 25, 2018. ^ "The Evolving India-U.S. Strategic Relationship: A Compendium of Articles and Analyses". Retrieved April 2, 2016. ^ "Indo-U.S. Relations: Moving Beyond the Plateau". Foreign Policy. July 30, 2015. ^ "21st Century is India's Century: IBM Chief Virginia Rometty". NDTV. July 14, 2015. ^ "Beyond the immediate present". The Hindu. January 26, 2015. ^ "Collateral Damage". New York Times. September 27, 2013. ^ "Nixon's dislike of 'witch' Indira". BBC World Service. June 29, 2005. ^ "Clinton Imposes Full Sanctions On India". Business Standard. May 14, 1998. ^ "India overcame US sanctions to develop cryogenic engine". Times of India. January 6, 2014. ^ "How Kargil spurred India to design own GPS". Times of India. April 5, 2014. ^ "India working on building fastest supercomputer". Deccan Herald. November 13, 2014. ^ "Indian scientists thwart Western embargo on manufacture of carbon composites". Centre for Science and Environment. August 30, 1992. ^ "The Wassenaar effect". Hindu Business Line. September 3, 2015. ^ "The geopolitical context of India-US ties". Zee News. September 23, 2015. ^ "The geopolitical context of India-US ties". Zee News. September 23, 2014. ^ "Maldives - Countries - Office of the Historian". Retrieved February 19, 2015. ^ "Nepal - Countries - Office of the Historian". Retrieved February 19, 2015. ^ "Pakistan - Countries - Office of the Historian". Retrieved February 19, 2015. ^ "Sri Lanka - Countries - Office of the Historian". Retrieved February 19, 2015. ^ a b "China - Countries - Office of the Historian". Retrieved February 19, 2015. ^ "U.S. Relations With Hong Kong". U.S. Department of State. Retrieved June 26, 2017. ^ "U.S. Relations With Macau". U.S. Department of State. Retrieved June 26, 2017. ^ "Japan - Countries - Office of the Historian". Retrieved February 19, 2015. ^ "Mongolia - Countries - Office of the Historian". Retrieved February 19, 2015. ^ "North Korea". U.S. Department of State. Retrieved November 28, 2016. ^ "Korea - Countries - Office of the Historian". Retrieved February 19, 2015. ^ "Republic of Korea (South Korea) - Countries - Office of the Historian". Retrieved February 19, 2015. ^ "Brunei - Countries - Office of the Historian". Retrieved February 19, 2015. ^ "Cambodia - Countries - Office of the Historian". Retrieved February 19, 2015. ^ "Timor-Leste - Countries - Office of the Historian". Retrieved February 19, 2015. ^ "Indonesia - Countries - Office of the Historian". Retrieved February 19, 2015. ^ See "Editorial: The ASEAN cage Jakarta Post7 July 2011". ^ "Truman Project". Trumanproject.org. Retrieved October 14, 2017. ^ a b "404". Archived from the original on March 31, 2012. Retrieved February 18, 2015. ^ "BBC News – Obama hails Indonesia as example for world". BBC News. November 10, 2010. Retrieved February 18, 2015. ^ a b "Laos - Countries - Office of the Historian". Retrieved February 19, 2015. ^ "Burma - Countries - Office of the Historian". Retrieved February 19, 2015. ^ "The EU's relations with Burma / Myanmar". European Union. Archived from the original on July 25, 2006. Retrieved July 13, 2006. ^ "Philippines - Countries - Office of the Historian". Retrieved February 19, 2015. ^ "Singapore - Countries - Office of the Historian". Retrieved February 19, 2015. ^ "Thailand - Countries - Office of the Historian". Retrieved February 19, 2015. ^ "Vietnam - Countries - Office of the Historian". Retrieved February 19, 2015. ^ "A Guide to the United States' History of Recognition, Diplomatic, and Consular Relations, by Country, since 1776: Australia". The United States recognized Australia on January 8, 1940, when the Governments of the United States and Australia announced the establishment of bilateral diplomatic relations. ^ "Q+A: Guyon Espiner interviews Kurt Campbell". Television New Zealand. October 11, 2009. Retrieved September 30, 2011. ^ "Fiji - Countries - Office of the Historian". state.gov. ^ "Fiji military stages coup, U.S. suspends aid". Reuters. December 5, 2006. Archived from the original on December 17, 2006. ^ "Kiribati - Countries - Office of the Historian". state.gov. ^ "Micronesia - Countries - Office of the Historian". state.gov. ^ "Nauru - Countries - Office of the Historian". Retrieved February 19, 2015. ^ "New Zealand - Countries - Office of the Historian". Retrieved February 19, 2015. ^ "Palau - Countries - Office of the Historian". Retrieved February 19, 2015. ^ "Papua New Guinea - Countries - Office of the Historian". Retrieved February 19, 2015. ^ "Samoa - Countries - Office of the Historian". Retrieved February 19, 2015. ^ "The Solomon Islands - Countries - Office of the Historian". Retrieved February 19, 2015. ^ a b "Tonga - Countries - Office of the Historian". Retrieved February 19, 2015. ^ "Vanuatu - Countries - Office of the Historian". Retrieved February 19, 2015. 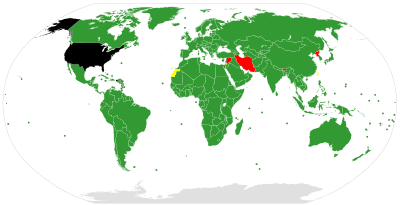 ^ a b "Countries with Limited or No U.S. Visa Services". Retrieved February 21, 2018. ^ "U.S. Relations With Andorra". U.S. Department of State. Retrieved May 26, 2015. ^ "U.S. Relations With Comoros". U.S. Department of State. Retrieved May 26, 2015. ^ "U.S. Relations With Kiribati". U.S. Department of State. Retrieved May 26, 2015. ^ "U.S. Relations With Liechtenstein". U.S. Department of State. Retrieved May 26, 2015. ^ "U.S. Relations With Maldives". U.S. Department of State. Retrieved May 26, 2015. ^ "U.S. Relations With Monaco". U.S. Department of State. Retrieved May 26, 2015. ^ "U.S. Relations With Nauru". U.S. Department of State. Retrieved May 26, 2015. ^ "U.S. Relations With Samoa". U.S. Department of State. Retrieved May 26, 2015. ^ "U.S. Relations With San Marino". U.S. Department of State. Retrieved May 26, 2015. ^ "U.S. Relations With Sao Tome and Principe". U.S. Department of State. Retrieved May 26, 2015. ^ "U.S. Relations With Seychelles". U.S. Department of State. Retrieved May 26, 2015. ^ "U.S. Relations With the Solomon Islands". U.S. Department of State. Retrieved May 26, 2015. ^ "U.S. Relations With Tonga". U.S. Department of State. Retrieved May 26, 2015. ^ "U.S. Relations With Tuvalu". U.S. Department of State. Retrieved May 26, 2015. ^ "U.S. Relations With Vanuatu". U.S. Department of State. Retrieved May 26, 2015.